A criminal case has been registered by the Mir Chowk police against All India Majlis-e-Ittehadul Muslimeen (AIMIM) chief and Hyderabad MP Asaduddin Owaisi and a few others for attacking a Congress leader's convoy at Mir chowk on Tuesday. According to a report in The Hindu, a case of assault resulting in simple injuries and criminal intimidation was registered against the Loksabha MP following a complaint lodged by Congress MLC Shabbir Ali in front of Mirchowk police station. The clash began after the arrest of Congress candidate Mohammad Ghouse. Ghouse, who recently resigned from the MIM to join the Congress, and MIM leader Ahmed Pasha Khadri were arrested in Khilwat when they clashed near a polling station after accusing each other of influencing voters on Tuesday. 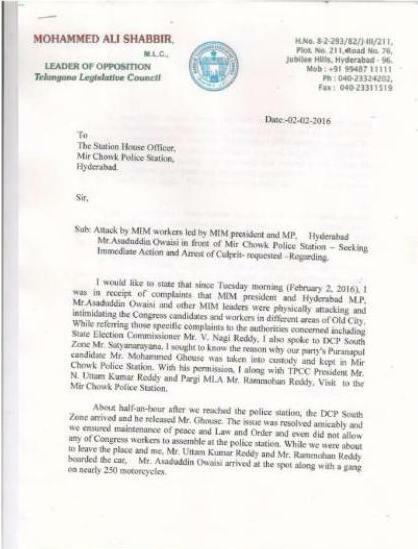 Sections 323 (assault) and others sections were also invoked against the MP and others over damaging Congress MLA Uttam Kumar Reddy’s car. Another case under sections 324 of IPC was booked against MLA Akbaruddin Owaisi by Chandrayanagutta police. The Malakpet police registered a case under section 307 (attempt to murder) against MLA Ahmed Bin Abdullah Balala for allegedly attacking MBT candidate Amjedullah Khan, The Hindu reported. MIM workers also attacked the house of deputy chief minister Mahmood Ali at Azampura and the Police was forced to disperse the MIM workers who allegedly tried to manhandle Mahmood Ali’s son Azam Ali. The deputy CM was present in the house when the incident occurred. Police arrested MIM MLA Ahmed Balala in connection with the attack and took him to the Bolarum police station, The Indian Express reported. The case was registered after a dharna at the DGP's office at Lakdikapul by TPCC president N Uttam Kumar Reddy along with other party leaders on Tuesday demanding arrest of MIM president Asaduddin Owaisi.